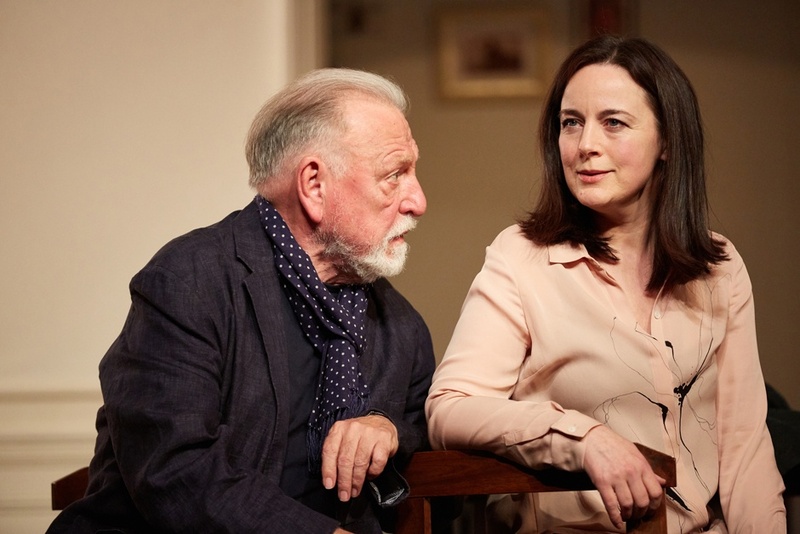 Fresh from Kenneth Cranham winning the Best Actor Olivier Award on Sunday for his heartbreaking portrayal of André in The Father by French playwright Florian Zeller, Mary, one of Richmond Theatre's volunteers, went to review the show ahead of it visiting from Monday 11th - Saturday 16th April. Initially we meet 80 year-old André and his dutiful daughter Anne who, we learn, is caring for her rather charming father. Within minutes there develops an uneasiness about what is happening on the stage. Presented with a series of snapshot incidents, the audience is dragged backwards and forwards through time and fragmented action, plunged regularly into a deep blackness, with the transitional music short-circuiting and looping relentlessly, until we are as confused about what is going on as André clearly is. We question ourselves as to where and when we are, whilst the somewhat generic room incrementally loses its features in parallel with André losing self-control. Nothing is reliable, as characters change faces in an instant and any given fact can be distorted moments later. This play explores core themes of dementia, mental illness and caring. We see the immense difficulty of a daughter trying to do her best for a parent who is becoming someone different, unable to prevent his inevitable degeneration. It shows us the vulnerability of the patient, and how easy it is for frustration with the situation to turn to abuse from others. For the sufferer himself memory loss is excruciating, but each time a forgotten memory is invoked anew it has the potential to bring blistering pain, just like the first time. André is a very believable and largely likeable character who draws the audience along on his agonizing journey. Kenneth Cranham gives an astonishing performance, snapping seamlessly between aspects of character and displaying elements of comic playfulness but ultimately descending erratically from a likeable, rational senior to a vulnerable and childlike victim. His despairing daughter, played sensitively by Amanda Drew, is torn between her duty towards her father, the demands of her obnoxious, self-serving husband and saving her own sanity. The pain caused by her father's insensitive words and her own supressed suffering is almost tangible as she endures year upon year of futile self-sacrifice, forced to watch as his decline courses relentlessly on no matter how she tries to help. The show has no interval, and we are locked into the drama for 95 minutes without relief. We cannot help but be moved as we share the experience of André's loss of dignity, and pained by his ultimate descent into terrifying fear and isolation, when the father becomes again a helpless child. Wracking it may be, but an extraordinarily gripping piece of theatre nonetheless, not to be missed. The Father is showing at Richmond Theatre from Mon 11 to Sat 16 April.